Hello, learners! Greeting from Makerdemy. In this course, you will learn how to program to build your “DIY Bluetooth Phone Controlled BB-8 Droid with Arduino Mega”. Arduino is one of the cost effective boards you can purchase & start programming with to interact with physical elements using logic & create results the way you want it. It can be used in your Engineering Projects, Industrial Projects, and Home Automation related projects. 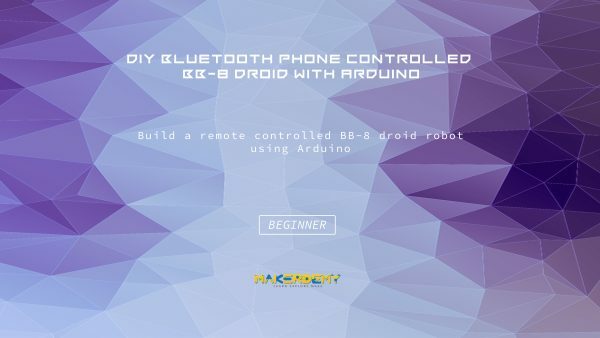 The course lesson will explain you, “How to work on your own DIY Bluetooth Phone Controlled BB-8 Droid with Arduino Mega” using Arduino programming language. This course works best for you if you own an Arduino UNO and Arduino Mega. This course is for anyone who is interested in building functional BB-8 droid robot to control remotely via mobile application with Arduino boards. And also you will learn to play the music using SD card adapter module. The course requires basic knowledge of Arduino programming language. It is designed to introduce the Arduino hardware and programming environment to get you started on building projects. This BB-8 model can control with a smartphone using an application downloaded from the Play Store and App Store, for both the devices. It can be controlled even with voice commands using Android application. I will also teach you how to configure the Bluetooth and SD card modules, and you can control it wirelessly. If you are a technology enthusiast and want to learn the cutting-edge technology, then this is the right course for you.